Sometimes students struggle to remember all of the story parts and how the parts of a plot work together to pull readers along. We reviewed the main parts of a story and then discussed how all of these story pieces and parts come together to create something “delicious” for the reader. 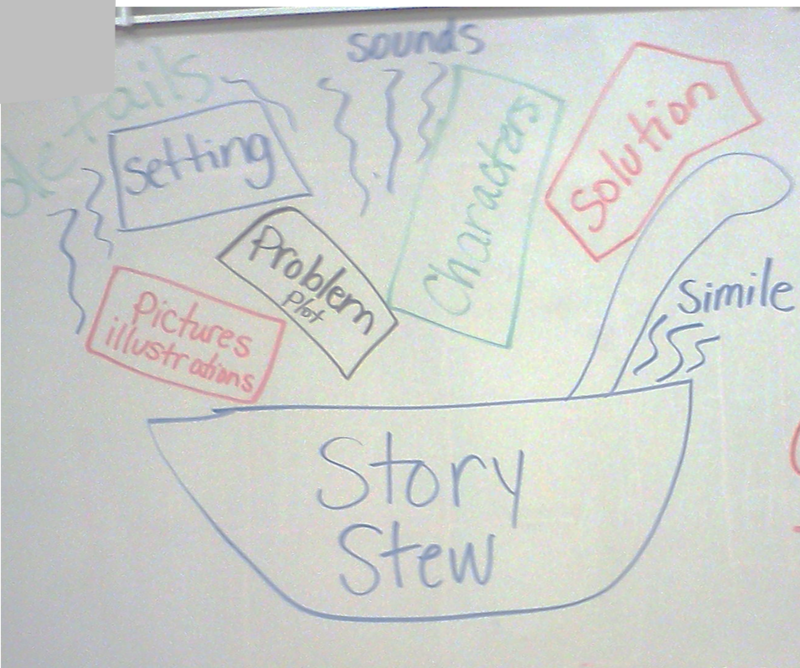 That’s when one of my students called it “Story Stew!” It was definitely an impromptu lesson path – story stew? Really?? But as teachers, we just roll with it! We brainstormed and developed a quick spur-of-the-moment picture on the whiteboard. My class LOVE developing their ideas into mini story anchor charts to put into their interactive notebooks, so that is where this lesson went. While they worked on their own mini-versions – (they are so creative! ), I worked on my good version to keep hanging in the class for the next several days. Here is how mine turned out. Of course, we like to keep some extra room at the top to add more “ingredients” over the next couple of days, but this is what they brainstormed today. They recognized that the mentor text included many details, and their writing did not. They discovered that the mentor text included similes and their own writing did not. We are using my Writing Prompts: Creative Writing Center activity from Teachers Pay Teachers. I think it’s loads of fun and my students enjoy learning what they will be writing about. The anticipation is so much fun! How this works is that the teacher selects a story part form to use, such as character or setting, etc., then each student chooses a number between 1 and 50. That number has a corresponding piece of the story. For example, a student may choose number 15, which (if using the character sheet) could correspond to a pirate, or a rock star, or the president! Then that character must appear somewhere in the story. My students need lots of practice with writing, so there may be more writing products on the horizon!